The Department of Physics at Warangal was started in June 1968 in Post Graduate Centre of Osmania University. The P.G.Centre was upgraded into Kakatiya University in August 1976. The first Vice Chancellorship of this university was Late. Prof.K.Venkata Ramaiah (Professor of Physics). 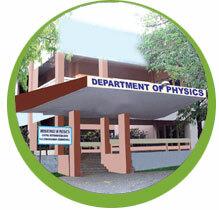 The Department of Physics offers teaching programmes viz., at the B.Sc. at University Arts & Science College and M.Sc., and P.hD., programmes at the Department in University College. The Department has vigorous ongoing research programmes to train Ph.D. scholars and has achieved national and international recog¬nition in the areas of Con¬densed Matter Physics, Theoretical Physics, Solid State Physics, Nuclear Radiation Physics and Materials Science. The specific areas of research include Crystal Growth Characterization, Magnetism, Phase Transitions, Glasses and Ceramics, Liquid Crystals, Semiconductors, Nanostructured Materials and Ferroelectrics. Besides developing its own research programmes, the department has strong interactions with national and international institutes/laboratories. This department has produced 89 Ph.Ds, This department also has distinction of having very good scholars spread in well reputed national and international academic institutions.